Get the number of bodies state is maintained for. By default, the volume bounds enclosing the geometry of the environment are computed to include all objects in the spaces collision checking is performed (env.collisionSpaces_). The linear and angular velocity bounds are set as -1 to 1 for each dimension. Read the parameters of the OpenDE bodies and store them in state. Set the parameters of the OpenDE bodies to be the ones read from state. The code will technically work if this function is called from multiple threads simultaneously, but the results are unpredictable. Fill the OpenDEStateSpace::STATE_COLLISION_VALUE_BIT of StateType::collision member of a state, if unspecified. Return the value value of that bit. Representation of the OpenDE parameters OMPL needs to plan. State space representing OpenDE states. Definition at line 50 of file OpenDEStateSpace.h. Index of bit in StateType::collision indicating whether it is known if a state is in collision or not. Initially this is 0. The value of this bit is updated by OpenDEStateSpace::evaluateCollision() and OpenDEControlSpace::propagate(). Index of bit in StateType::collision indicating whether a state is in collision or not. Initially the value of this field is unspecified. The value gains meaning (1 or 0) when OpenDEStateSpace::STATE_COLLISION_KNOWN_BIT becomes 1. The value of this bit is updated by OpenDEStateSpace::evaluateCollision() and OpenDEControlSpace::propagate(). A value of 1 implies that there is no collision for which OpenDEEnvironment::isValidCollision() returns false. Index of bit in StateType::collision indicating whether it is known if a state is in valid or not. Initially this is 0. The value of this bit is updated by OpenDEStateValidityChecker::isValid(). This bit is only used if the OpenDEStateValidityChecker is used. Index of bit in StateType::collision indicating whether a state is valid or not. Initially the value of this field is unspecified. The value gains meaning (1 or 0) when OpenDEStateSpace::STATE_VALIDITY_KNOWN_BIT becomes 1. The value of this bit is updated by OpenDEEnvironment::isValid(). A value of 1 implies that a state is valid. This bit is only used if the OpenDEStateValidityChecker is used. Definition at line 53 of file OpenDEStateSpace.h. 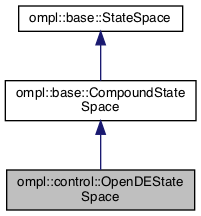 Construct a state space representing OpenDE states. This will be a compound state space with 4 components for each body in env.stateBodies_. The 4 subspaces constructed for each body are: position (R3), linear velocity (R3), angular velocity (R3) and orientation (SO(3)). Default bounds are set by calling setDefaultBounds(). Definition at line 43 of file OpenDEStateSpace.cpp. Definition at line 156 of file OpenDEStateSpace.cpp.